Continuous Feedback with Heroku and the Usersnap Add-on! targeturls (comma-separated, optional – default: configured domains for heroku app): Specify the list of URLs which you intend to use Usersnap. subject (optional – default: “[Usersnap] New Usersnap feedback”): Particularly useful if you want to create an email filter to organize your screenshots. After installing Usersnap, the application should be configured to fully integrate with the add-on. Usersnap only works for publicly available (e.g. deployed) sites in general. If you want to use Usersnap in a local or internal development environment, please read following FAQ entry on usersnap.com. For more information on the features available within the Usersnap dashboard please see the docs. The Usersnap dashboard allows you to manage the URLs where the Usersnap button should be displayed. You are also able to choose the way screenshots are delivered to you (Email, Basecamp, JIRA etc.). Another very useful tool is the snippet configurator which gives you the possibility to customize your Usersnap widget in a very comfortable way. … or by visiting the Heroku apps dashboard and selecting the application in question from the Add-ons list. Usersnap can also be removed via the CLI. Do keep in mind that this will destroy all associated data and cannot be undone! Give it a try – FREE public Beta on Heroku! Improve your agile deployment processes by adding annotated screenshots and actionable bug reporting to your utility belt. 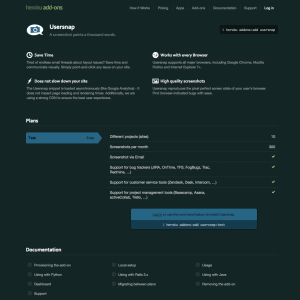 Usersnap for Heroku is currently in public beta – you can try it for free! For all Usersnap support and runtime issues, please have a look at our Heroku Add On Documentation or contact the Heroku Support channels. Any non-support related issues or product feedback is welcome at contact@usersnap.com.